I’ve been sitting on this news for a few weeks now for several reasons, most of which have to do with the limited time I now have to bake, photograph, and blog. As it turns out, working in entertainment is most definitely NOT a 9-5 job and we’ve been 1000% slammed at work—though, thankfully, in a great way! Between that, computer science night classes at UCLA Extension, the kick-off of triathlon training season, and my stubborn determination to maintain some semblance of a social life on my off hours, it’s been hard to find a spare minute to sit down and really write. But the prospect of heading off to the UK again in a few months’ time—and finding a perfect excuse to make this cake that I’m sharing with you all today!—was too tempting to resist. Clearly. I first discovered Victoria sponge cakes when I went to visit England nearly two years ago, on my first personal trip to Europe. I wrote about it in this post and wholeheartedly plan to pig out on at least five slices (over afternoon tea, of course!) the moment I land in London toward the end of this year. For those of you who aren’t familiar with this quintessential British treat, I explain a brief history of the cake here and will just add that this is THE perfect cake to lead into the spring and summer months. 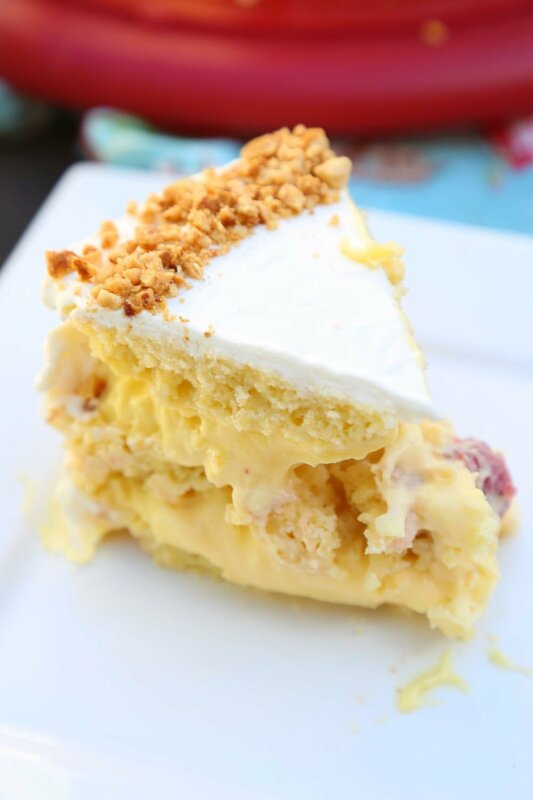 With its light, springy texture and irresistible hint of strawberries folded into freshly-whipped cream, it’s hard not to shove my face straight into this cake after a twelve-hour work day! This time around, I decided to revamp my original (and favorite!) Victoria sponge cake recipe with the addition of two essential ingredients: an easy-to-make pastry cream-style custard and fresh, ripe strawberries, both sandwiched between three layers of fluffy cake. And the BEST part? As beautiful and complex as it looks, this custard-filled Victoria sponge cake only takes a couple of hours to make and assemble. Not a bad way to prep the palette for another adventure across the pond! This time, I’m even more excited that I’ll be visiting one of my best friends—Mops!—a fellow UCLA alumna that I met in grad school nearly three years back. I’m secretly planning on sneaking her some freshly-baked goods (though this cake probably wouldn’t hold up on an 11-hour flight, sadly!) and I’ll also continue testing some of the Europe-inspired recipes that I promised to share last year when I made my last sojourn to the continent. Till then, though…make this cake, eat it, and be merry! 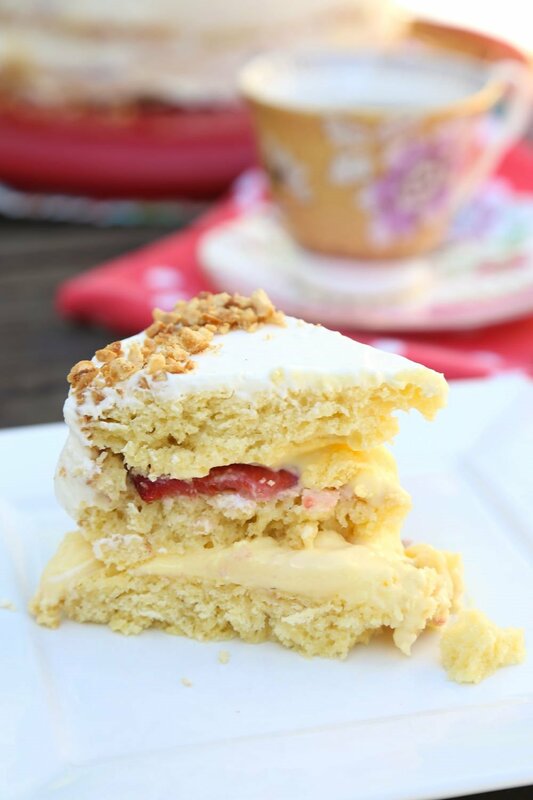 This decadent twist on classic British Victorian sponge cake is filled with creamy custard and fresh, ripe strawberries in place of traditional jam. 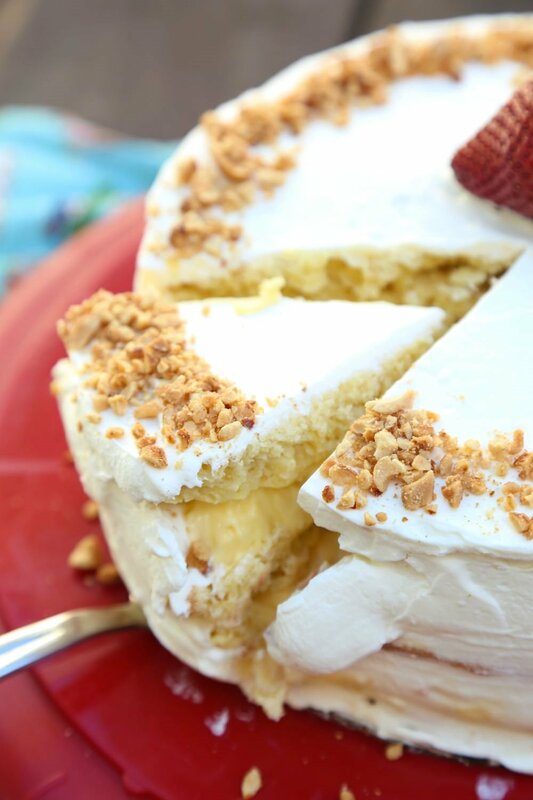 Perfect to serve as a standalone dessert or with a cup of afternoon tea! Prepare your custard: Combine instant vanilla pudding, heavy cream and milk in a medium bowl. Cover with cling wrap and refrigerate as you bake your sponge cake. In a separate large mixing bowl, cream together butter and white sugar until light and fluffy. Mix in eggs and vanilla. Gently fold in flour, baking powder, and salt until just incorporated. Divide batter evenly between the three prepared pans. Bake in preheated oven for 18-23 minutes, until lightly golden and springy to touch (a toothpick inserted in center of cake should come out clean). Immediately transfer to freezer for 15-20 minutes until cake has mostly cooled, then carefully transfer from pans to a wire rack. (Note: the freezer trick, while not necessary, helps retain moisture in the cake layers. You may also allow your cake to cool completely in pans at room temperature before transferring to wire rack. Meanwhile, in a second large mixing bowl, use a hand mixer to whip heavy whipping cream until stiff peaks form. Set aside. 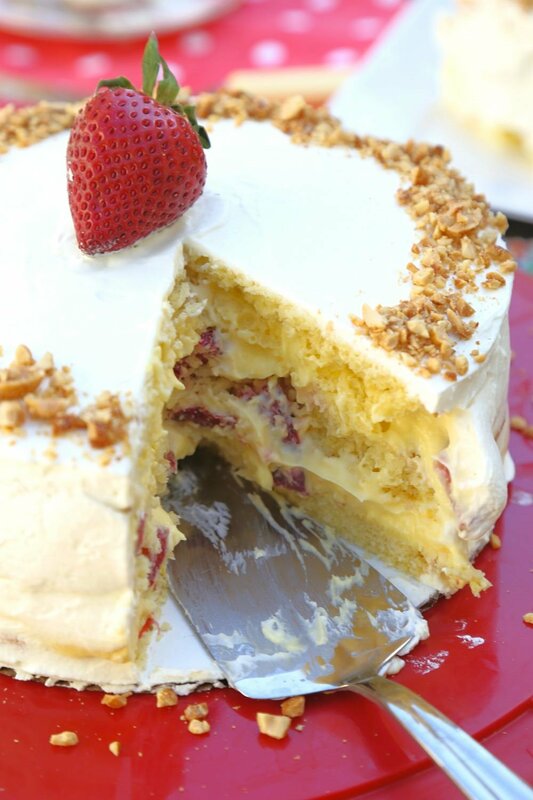 To assemble cake: Spread 1/2 of your custard evenly on first layer of cake, then layer half of your strawberries on top. Carefully stack on second cake layer and repeat. Stack third cake layer, then frost along top and sides with whipped cream. Garnish with sliced strawberries or other fruit if desired. 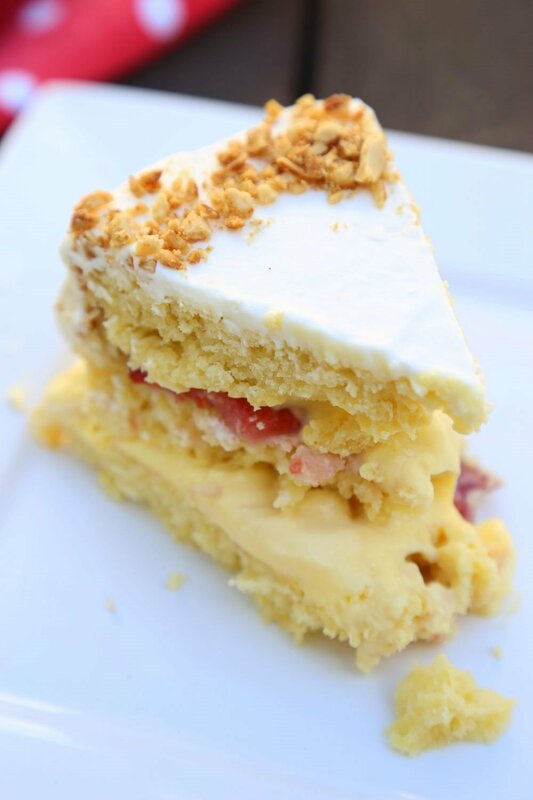 This decadent twist on classic British Victorian sponge cake is filled with creamy custard and fresh, ripe strawberries in place of traditional jam. 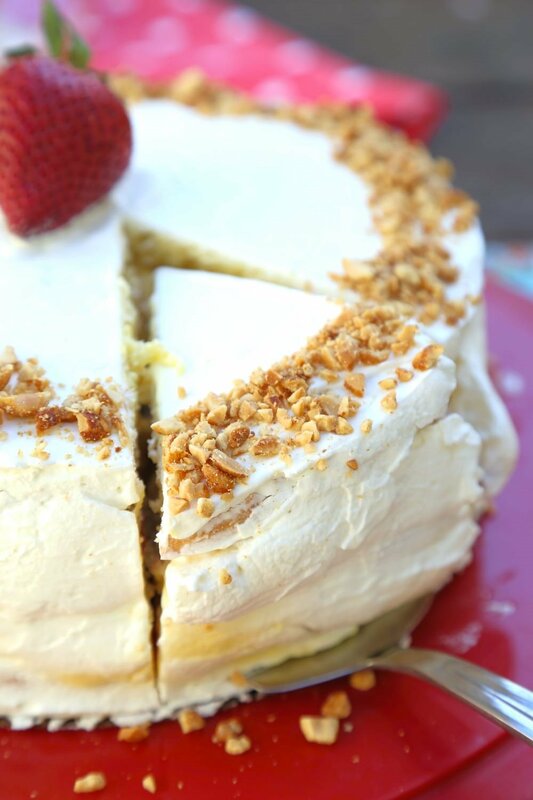 Perfect to serve as a standalone dessert or with a cup of afternoon tea! This article first appeared as part of UCLA Connect’s Alumni Newsletter–you can read the original here. London is such a nice travel destination! You’ll have a wonderful time. And we’ll have a wonderful time eating this! Once we make it, of course. 🙂 Thanks! You mention sharing the batter between 3 tins but only suggest to prepare 2. It didn’t rise at all, and was dense. Are you missing any extra liquid from batter recipe?